Hello everyone! Are you ready for this week's challenge...we want you to be inspired by a song..not just any song though...with February and Valentine's Day upon us, we want you to be inspired by a LOVE SONG! From the heart and from the soul, show us your love song inspired projects! 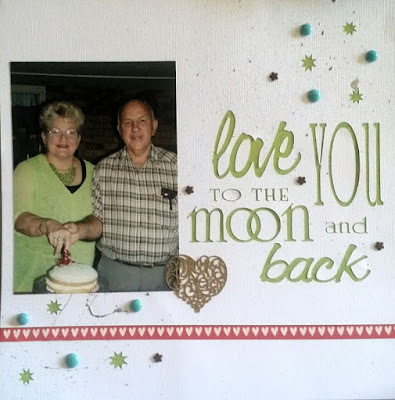 For this weeks challenge I took my inspiration from an Australian band called "Secret Garden" and their song "To the Moon & Back" in creating both my title for this layout as well as sentiment towards our gorgeous "adopted" Nan & Pop whom we all love "to the moon and back"! I chose Madonna's 1985 song Crazy For You to title my page. I, too, was inspired by Madonna's Crazy For You song to make a Valentine's Day card. I was inspired by the Bette Midler song Baby Mine. I think that the love a mother has for her child is one of the greatest in the world...my son is my everything..it felt like I waited for him forever, but I just had to wait until the time was right to accept all that love!